In the 80's female idols were still everywhere and advertised everything. The only thing different then in comparison to the previous decades was that since the 80's were the 「hi-tech」 era, idols were now advertising VCRs and PCs as much as candy bars and instant ramen. 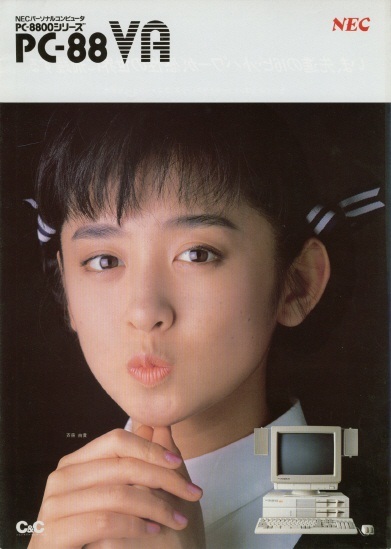 And when it came down to advertising personal computers in the 80's, no one did it better than the adorable-looking 「YUKI SAITO」. 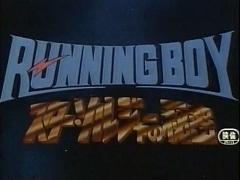 RUNNING BOY : THE SECRET OF STAR SOLDIER (ランニングボーイ スター・ソルジャーの秘密) is an original anime film created by FILMING INTERNATIONAL for HUDSON SOFT. Today I'd like to reminsce about some of my favourite retro tokusatsu (live-action special film) TV shows. Here's three of them, feel free to tell me what you think! I even actually owned a ROBOT 8-CHAN toy figure when I was a kid. From what I can remember it was very cool, extremelly well-made for it's time, and heavy! For the '70s, I think this was the closest a live-action TV show got at resembling an actual manga or anime. I specially like all the little details and attention put into ROBOCON. The way they made so many little gadges come out of the costume, how the big clockwork key-thingie on top is always spinning, and how different ROBOCON eyes were used to show emotion. Definitely a top-notch show! Instead of PETER PARKER we have TAKUYA YAMASHIRO, a young motorcycle racer who sees an UFO falling to earth. The UFO turns out to be a spaceship called the「MARVELLER」which comes from planet「SPIDER」. The last surivor of SPIDER then gives TAKUYA the「Spider Bracelet」, which as you all probably already figured it out gives TAKUYA spider-like super powers. Arguably the best game music band of all time performing live at the legendary Game Music Festival ver.90. While all of the S.S.T. Band live performances are worthy of watching, these in 1990 are special since they feature some very cool video back-up footage from the actual SEGA games. The band leader still at this point was none other than the legendary HIROSHI「HIRO」KAWAGUCHI (the main keyboard player with the ponytail), who is responsible for some of the most memorable SEGA game soundtracks of the '80s like FANTASY ZONE, HANG-ON, SPACE HARRIER, OUT RUN, AFTER BURNER, among many others. SPRINTER (SUPER HANG-ON) ~ GALAXY FORCE Medley ~ BURNING POINT (THUNDER BLADE) ~ VERMILLION Medley ~ LAST WAVE (OUTRUN) ~ POWER DRIFT Medley ~ MAIN THEME (PHANTASY STAR III) . I hope this post encourages at least some of you to look into the rest of the S.S.T. BAND stuff in YouTube, since of course is simply awesome. This is definetly one of the best retro game commercials from the '80s, with a very professional TV anime show quality production. Despite having some really great developer teams like WOLFTEAM and RIOT among their ranks, NIHON TELENET nonetheless gained a questionable reputation as a game publisher in Japan, since in general most of the games they published were praised more for their excellent character designs and decent storylines than for their gameplay. This CM is further proof that NIHON TELENET were at their best when it came to come up with cool anime character designs and themes. So I really can't help but think they would have fared better if they had also incursionated as an animation studio. Ironically, out of the 4 different incarnations of the original VALIS game, the FAMICOM version is by much the worst. But since the FAMICOM was by far and away the most popular home game system in Japan at the time, then it's very likely the sales expectations of the FC version were superior that those for the other versions, and that alone was probably more than enough incentive for NIHON TELENET to release this exceptional promo CM for it.